Georgia National Guard Command Sgt. Maj. Buddy Grisham, center, is joined by fellow troops as they help people get their stranded cars out of the snow Wednesday in Atlanta. Georgia Gov. Nathan Deal took responsibility Thursday for the state's slow response to a snowstorm that left people stranded for more than 24 hours on gridlocked interstates, and his top emergency management official said flatly: "I got this one wrong." Deal pledged to reporters that the state would be more aggressive in responding to future weather threats. "I'm not going to look for a scapegoat," he said. "I am the governor. The buck stops with me. I accept the responsibility for it, but I also accept the responsibility of being able to make corrective actions as they come into the future." City and state officials had plenty of warning that a big storm was on the way, and on Thursday, both the governor and emergency management director took responsibility for the fallout. NBC's Tom Costello reports. He added: "We will take those weather warnings more seriously." Charley English, head of the Georgia Emergency Management Agency, said he had made a mistake by activating the state's emergency response center six hours too late, long after the National Weather Service upgraded its winter storm alert for Atlanta on Tuesday morning. "I made a terrible mistake, and I put the governor in an awful position," he said. Thousands of people were stuck without food and water on the interstates in and around Atlanta after the storm struck Tuesday afternoon. Thousands of schoolchildren were also marooned overnight in their schools or on buses trapped on the road. 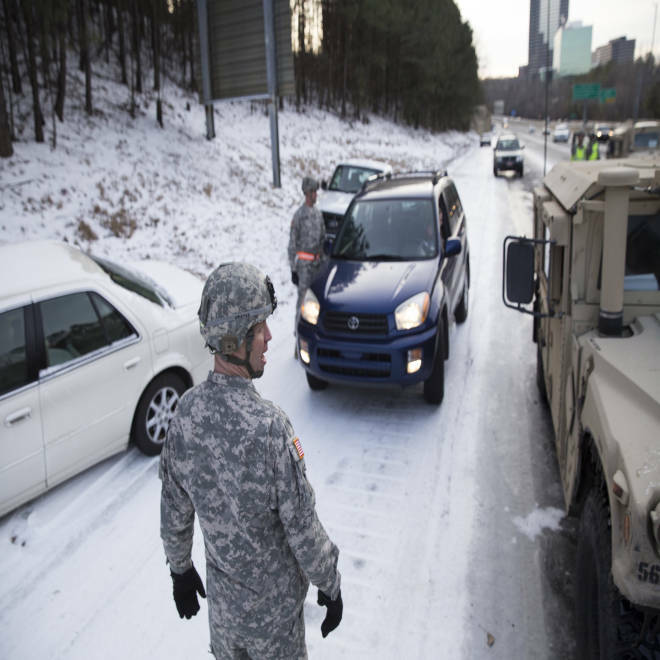 In Atlanta on Thursday, the National Guard helped people retrieve abandoned cars that littered the Atlanta interstates. Meanwhile, the mayor and the governor struggled with the political fallout. Mayor Kasim Reed had assured people on Tuesday, in a message on Twitter before the snow began to fall: "Atlanta, we are ready for the snow." Facing criticism over the city's response to an unusual winter storm, Mayor Kasim Reed says that while Atlanta didn't have the experience to deal with the unusual weather, its efforts have made 80 percent of the city's roads passable. Thursday, he acknowledged that authorities made a mistake by not staggering their orders for people to go home — schools first, then private businesses, then government employees. Instead, hundreds of thousands of people poured onto the interstates at the same time. But Reed suggested, in a pair of interviews on NBC's TODAY and MSNBC's "Morning Joe," that he was being unfairly blamed for traffic that clogged highways outside the city limits. "I think we need to work much harder on coordination," he said on MSNBC. But he stressed: "The highways are not the responsibility of the city." It was the latest episode of finger-pointing after the storm. Wednesday, the governor infuriated meteorologists by calling the storm "unexpected" and saying nobody "could have predicted "the degree and magnitude of the problem." Atlanta student David Hunter and his mother, Demetra Dobbins, walk up an exit ramp Wednesday along I-75 North. In fact, the National Weather Service issued a winter storm warning for Atlanta at 3:39 a.m. Tuesday, 12 hours before the worst of the traffic set in. Cities in the North are much more accustomed to snowstorms, and in places like New York, powerful mayors have the single-handed authority to order salt-spreaders and plows onto the streets. But the Atlanta area, as frustrated experts pointed out, is a patchwork of regional governments that often don't get along with one another. It also has a deeply ingrained car culture and a mass transit system that serves only a fraction of the metro area's 5.5 million people. In 2012, voters across the region defeated a one-penny sales tax that would have strengthened regional transit. After a snowstorm hobbled Atlanta in 2011, Reed, the Atlanta mayor, wrote in The Atlanta Journal-Constitution that he had learned an important lesson about collaboration and cooperation. "We will work faster and smarter to deliver the kind of response that our residents demand and deserve," he wrote. Asked on "Morning Joe" why authorities hadn't worked better together this time, he said: "I think that we all have responsibility."